In remarks today to the 19th Annual Hyman P. Minsky Conference, St. Louis Fed President James Bullard assessed the state of the regulatory reform debate. In his presentation, Containing Risk in the New Global Financial Landscape, Bullard said, As the nations lender of last resort, the Fed will be at the center of managing any future financial crisis and this argues for the Fed playing the lead role in the new regulatory structure. A future Fed with an appropriately broad regulatory authority provides the U.S. with the best chance of avoiding a future crisis. He also described how current regulatory reform proposals are not adequately addressing several key issues that could contribute to future financial crises. Only a few of the current financial reform proposals are likely to help prevent future crises, most are not, said Bullard. These issues include the susceptibility of non-bank financial firms to run-like phenomena; the existence of large financial firms worldwide that are too big to fail; the question of how any form of regulation could prevent an entire industry from adopting the same strategies, and addressing government-sponsored enterprises (GSEs). Bullard emphasized the critical need to consider the entire financial landscape rather than just the banking sector. 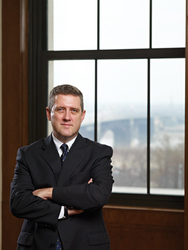 The crisis encompassed a far larger segment than just commercial banking, Bullard said. Many non-bank financial firms, outside the banking sector, were at the heart of the crisis. These firms were not regulated by the Fed. He added, As the crisis started in the fall of 2007, 20 firms accounted for about 80 percent of financial sector assets in the U.S. He noted that about one-third of this total was comprised of bank holding companies, with two-thirds comprised of non-bank financial entities such as the GSEs (Fannie Mae and Freddie Mac), investment banks, insurance companies, and thrifts. The non-bank financials are a whos-who of the most nettlesome entities during the crisis, he added. All of these firms faced severe stress during the crisis, regardless of the type of firm or the nature of regulation, he said. This is generally true globally as well. All were taken in by the allure of securitized products in various ways. Bullard questioned whether current regulatory reform proposals would help prevent a similar scenario from happening again. How can we prevent an entire industry from adopting the same strategy? he asked. I do not see this being addressed in current proposals. Bullard explained that the U.S. has a primary regulator system for the nations more than 8,000 commercial banks and thrifts. The primary regulator has the key authority for the regulation of the bank, he said. Before the crisis (as of January 2007), the Fed had primary regulatory responsibility for about 12 percent of the banks, or about 14 percent by assets. The remaining 85 percent of banks and assets had non-Fed primary regulators, he noted. Then, as the crisis unfolded, all eyes turned to the Fed as the lender of last resort. Due to its narrow regulatory authority, the Feds view of the financial landscape was limited coming into the crisis. This made it harder to perform its lender-of-last-resort role, Bullard said, And, this led to a lot of ad hoc decision-making. Bullard called for a strengthened central bank and cautioned against some current regulatory reform proposals that seek to create a Wall Street-only Fed. The Fed should remain involved with community bank regulation so that it has a view of the entire financial landscape, he said. It is important that the Fed does not become biased toward the very large, mostly New York-based institutions. Bullard explained that one critical role of regulation is to provide a level, competitive playing field for institutions of all sizes. Community banks tend to fund smaller businesses, an important source of job growth for the economy. Understanding this process helps the Fed make sound monetary policy decisions. He added, Regulation works well for the thousands of community banks in the U.S. The system features deposit insurance plus prudential regulation. The system allows failurecapitalism at workbut prevents bank runs and the associated panic. Community banks did not cause the crisis and do not need to be re-regulated. The central bank must be well-informed about the entire financial landscape in order to head off a future crisis. The reform response should be to provide the Fed with an appropriately broad regulatory authority, Bullard concluded.